Great Family Home with Beach Lifestyle! 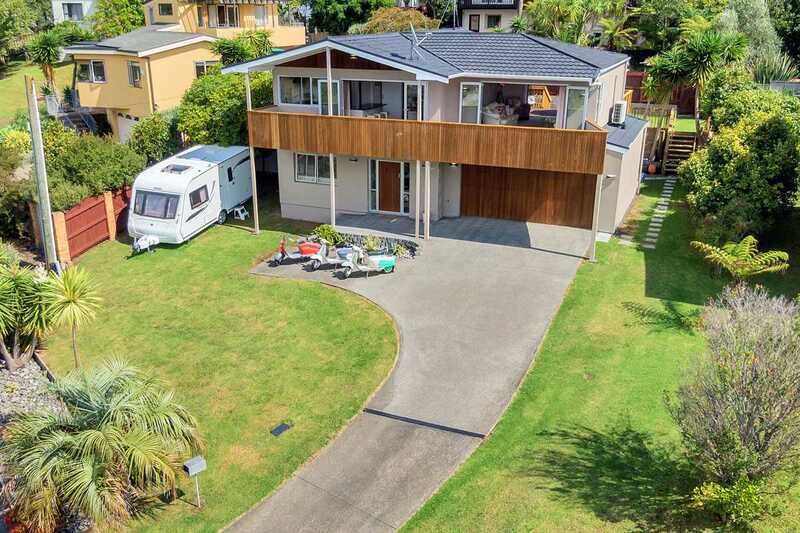 - Built in the 1960's, with more recent extensions, this excellent family home occupies an elevated and sunny position, in a sought after street 450 metres to beach. - Occupying a freehold site of 627sqm with either 5 bedrooms plus large open plan living, or utilise the 5th bedroom as a second living space. A great layout for a family offering some separation if desired. - Renovated in approximately 2007, is very comfortable as is, or come and add your own design flair with some further cosmetic updating. - Large rear deck from the lounge leads down to a flat lawn perfect for the kids and pets, whilst a spa pool is tucked away on the ground floor patio. - Generous internal access garaging plus excellent on-site parking completes the picture. - If you have been searching for something special - want to make a house your home, love the beach and fantastic schools - this is your chance to secure a fabulous lifestyle. Zoned for Rangitoto College, Murray's Bay Intermediate and Murray's Bay Primary - ensuring every educational need is catered to. - Proximity to local beaches, boutique shops and all of the amenities on offer in Mairangi Bay adds strength to any investment. Families will just love it here, on all bus routes, easy access to the CBD, a wonderful relaxed coastal lifestyle! - Our vendors are Serious about selling. Call us now! Construction: Plaster, Block, Cedar and parts that are plaster are solid 20mm plaster with a cavity all detail on council file which listing agents have. Chattels remaining: Blinds, Fixed floor coverings, Light fittings, Stove, Blinds, TV Aerial, Fridge, Spa, garden shed, Heat Pumps x 2, garage door remote x 1, dishwasher, rangehood, waste disposal, smoke alarms, clothes line, washing machine.